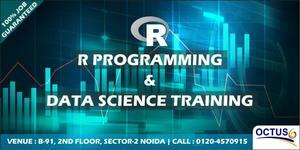 Octus offer R Programming & Data Science training with 100% Job Guaranteed. Data Science is the multidisciplinary blending of technology, algorithm Development, and Data Inference for solving intricate analytical problems. Data science training helps to mold yourself as an unfolding analyst who contributes a lot in gathering the data across variegated platforms. For those who want to acquire an influential as well as a long-lasting career, data Science is should be your choice.